I hate treadmills. There is nothing worse than running and going nowhere...in my opinion :) For years, I would go to the gym and ignore the boring cardio machines, opting to only lift weights. I was missing out on so many benefits of doing cardio, but I didn’t want to be bored!! High Intensity Interval Training was the answer for me. The treadmill wasn’t so horrible if I was sprinting as fast as I could for 30 seconds then taking a break for a bit. Challenging myself like that was the only way I could stomach the treadmill. After a while though, that too became mundane. Boot Camp training was the answer for me. Doing a variety of cardio drills alleviates boredom completely and not only will your heart benefit, you might have to shop for new clothes in a smaller size! If you are one that doesn’t have time for long drawn out bouts of cardio I have good news! You can get the same results from short bursts of activity…if done correctly! Cardiovascular activity like running helps to increase the density of your capillary network. Capillaries are tiny blood vessels that cover your entire body delivering oxygenated blood and nutrients to where they are needed and taking away toxins and other waste products from cells. By increasing the density of your capillary network you create an environment where greater oxygen delivery is possible and waste disposal is made more efficient. 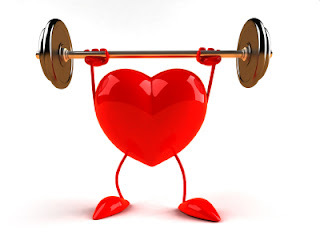 Cardiovascular conditioning like running can help lower blood pressure. While the scientific reasons for this are unclear, it has been observed as a common by-product of those who exercise regularly, particularly if blood pressure was high to begin with. In fact many doctors will recommend patients commit to a period of cardiovascular activity if they discover they have high blood pressure! One of our fit chicks Dee recently got a great dr. report and was able to discontinue her blood pressure meds due to her fitness training at Texas Fit Chicks bootcamp! Greater blood flow means you can circulate greater levels of oxygen around the body and produce energy more efficiently. Enhanced blood flow will also help remove waste products and toxins more effectively. Stroke Volume refers to the volume of blood the heart pumps per beat. Cardio exercise can cause a substantial increase in stroke volume both at rest and when exercising. Many people experience a substantial lowering of resting heart rate after improving their conditioning through cardio exercise. This is likely to be caused by an increase in stroke volume and improved oxygen delivery. The result is the heart has to beat fewer times per minute to deliver the same amount of oxygen. A resting heart of 70bpm or lower is excellent. Cardio exercise is fantastic means of increasing your weekly energy expenditure. For those of you fit chicks looking to burn fat this is good news. Increasing your energy expenditure makes it more likely that you will create the required energy deficit for fat loss to occur. Remember if your body has an energy surplus then there is no need for the body to dig into its own energy reserves (fat) to make up the short fall. For those of you that play sports, enhancing your conditioning will only help your performance. More often than not it is the player or team who is able to maintain their intensity for longer that will come out on top in an athletic setting. At Texas Fit Chicks bootcamp, we incorporate Tabata training during our workout. This high intensity training protocal will give you greater benefits than steady state training. Our bodies also never have the opportunity to plateau when you participate in our boot camps, since every single workout is different.Our clients see the benefits of working out in as little as 4 weeks with us. Join us and start this Monday to make sure your workout will get you the results you want to see. We take the guesswork out of losing weight and getting healthy! Wonderful writing.This article has given many great tips.Now I want to share a something with you. Making exercise a propensity can help lower your lower blood pressure. It likewise provides for you more vitality and is an extraordinary approach to simplicity stretch and feel better.check in with your specialist first in case you're not effectively dynamic now. They'll verify you're prepared for exercise. Since a dynamic way of life is useful for your lower blood pressure, your specialist will probably be for it.Best of luck.!!!!!!!!!!!!!!!!!!!!!! !